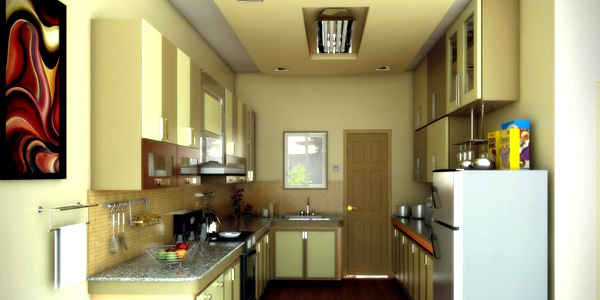 You may have been thinking on how to design your small kitchen space. You really don’t need to worry for you can still have a great kitchen no matter how small it is. The only key is considering how you use the area, make sure that the things you need are in there and you will apply the style you really want. Aesthetics come after function especially that the kitchen is a working area for preparing meals. So, make sure that you will be able to use your kitchen the way you want it. For sure, one needs to be creative in order to have enough storage places in the small kitchen. Storage is very important to keep your kitchen free of clutter. But aside from that, there are still other things that can help make your small kitchen look larger. 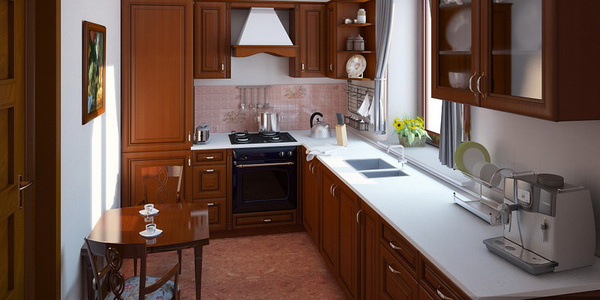 Here are some tips for your small kitchen design. 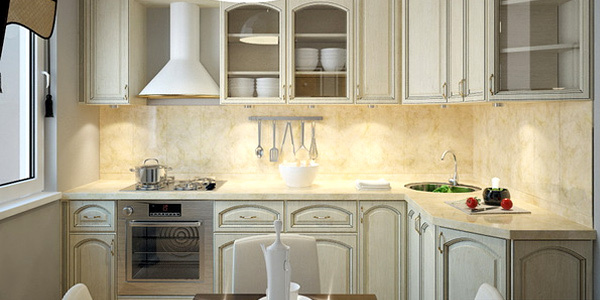 The first thing you need to do is to determine the usage of your kitchen. 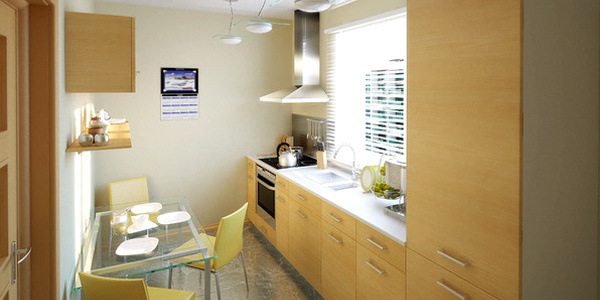 The manner of using your kitchen can tell you the kind of layout you would need especially if your area is small. You have to make sure that function and usage will be given attention first before the design. 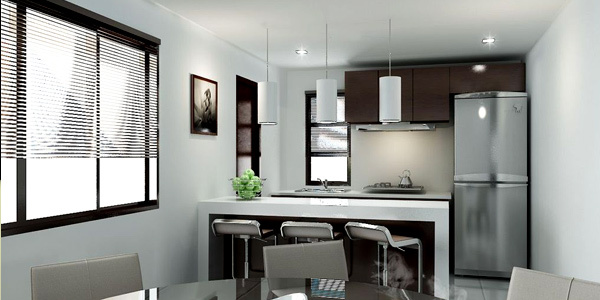 After that, take note of your own design style including color and accents in the kitchen. Every kitchen would have cabinets in order to keep things organized. Use simple and flat cabinets free from details. 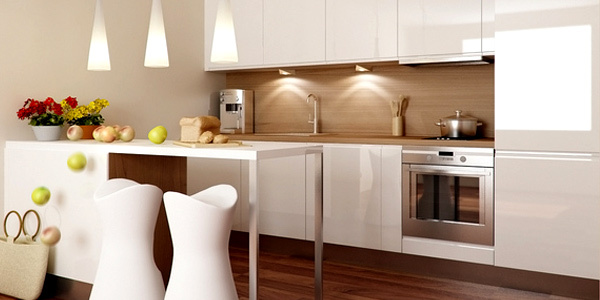 You can make your kitchen look larger by using glass doors. You can also use floating or open shelves which gives a clean look. This makes the space look bigger for the eyes will continue from wall to wall. But make sure that everything you place there are organized and clean. It would even be better if you use a single color of dishware for a more unified look. Use solid colors and clean lines for your cabinets and shelves. Color can greatly help in making your kitchen look bigger. The color of everything in your kitchen should be considered which includes the appliances, counters, stools, dishtowels and others for it can greatly affect the atmosphere of your kitchen. Use cool colors for it can give a diminishing effect. Use light or pastel colors that can reflect light and draw the eyes upward. You can still use exciting color combinations and patterns in your walls. 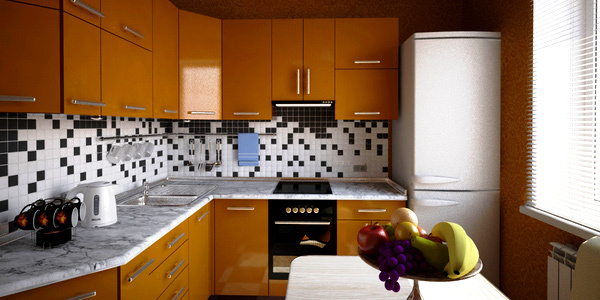 Bold colors can still be great in a small kitchen. For your small kitchen, you can opt for checkerboard black and white linoleum which is very affordable. This can make your flooring look attractive. Or, since the space is small, you could afford to use marble that can give a very stunning look for your kitchen. Or you can try using cork that is properly sealed to avoid absorption of water for green flooring. You can add aesthetic to your flooring by using a rug or a carpet on it that fits the color and style of your kitchen. By using more glass materials, your kitchen will surely look larger for it allows light to bounce around the area. 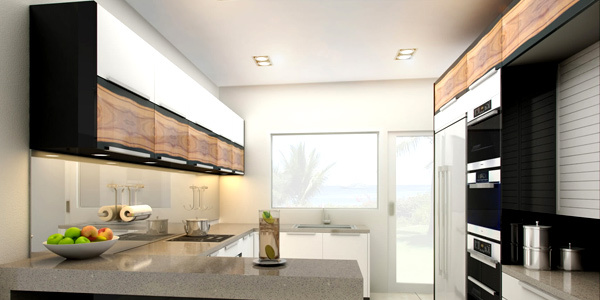 You can use glass counter or tabletop, glass door cabinets and others. You can even have a glass kitchen door that allows you to see the other areas of the house or a perfect view of your yard. This can help expand your space visually. You can also use reflective glass tile that can make your kitchen look sparkling. Place some incandescent lighting under your hanging cabinets and let it shine down your countertops that will increase the shadowing, giving it a visual movement. You can place lights under the base of your cabinets, too. 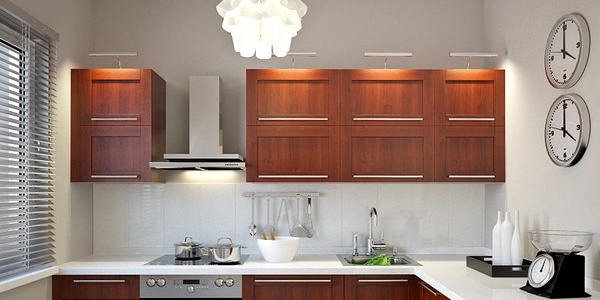 But do not forget to install fluorescent lights that can increase the larger look of your kitchen. Adding some touches on the ceiling can help you have a better looking kitchen. You can add dimension to your ceiling by using some lighting. Apply some design that suits your style and personality. This can attract the eyes of the viewer towards it, adding a vertical depth. Use white and other light colors for the ceiling. Since the kitchen is used primarily for meal preparation, you have to make sure you have all the appliances you need like refrigerator, microwave, range and others. But see to it that they are well placed. Do not use too large appliances for it can only occupy a large space when a smaller version of it can also function the same. For your work area, you can consider a small scale island or counter-topped cart that can be rolled away when not used. Do away with that boxy feeling in your kitchen by using open storage instead of close cupboards. Also, if it is applicable, you can do away with an island. Consider the usage of the area. If you think that you can already work well without an island, then be it. 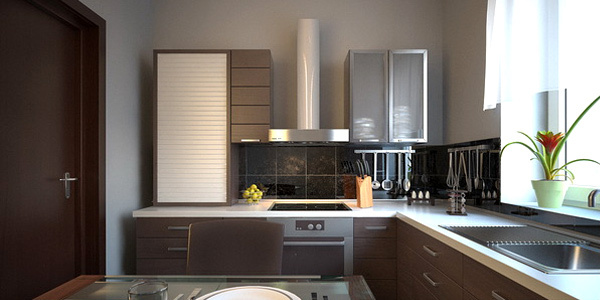 Make your kitchen as open as possible with only the necessary things in it. By using various materials in your kitchen, you can give it a great aesthetic no matter how petite it is. You can apply this in your countertop surfaces, cabinetry, fixtures, flooring, color and lighting. Since you won’t be able to have so many details in your furnishings, you can experiment by using various materials that can give your kitchen a great interior design. 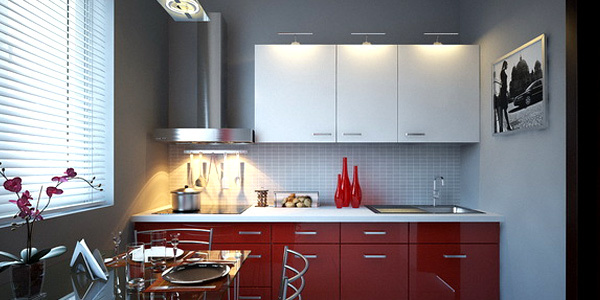 To have a concise look, use one color for your fixtures and cabinets. When choosing for your design, make sure that it will not make your kitchen look crowded. You can go for a country cosy kitchen where you can have a little nook and use only the furnishings that you need. You can use dark rich colors to create a sophisticated feeling combined with some simple accessories. You can make your kitchen look cosy even it is small. Some really nice designs here. Is it now common place that the dining/kitchen tables are no longer in the kitchen and are in fact in a seperate room? I’ve always liked the look of the table being in and around the kitchen. Maybe I need to catch up with the times! She looks so good .